Remove the top of the stool. An easy undercoat? Grab a can of cheap white spray paint and spray it all over. I then used 3 coats [ wait 1 hour between coats] of white gloss exterior paint [ it is thicker and hardier than normal paint I find]. 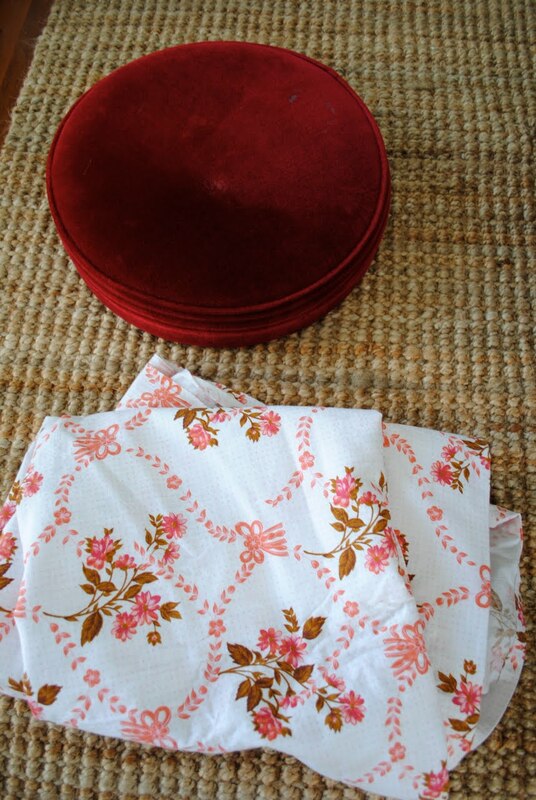 Grab some vintage fabric [I used a vintage bedsheet]. 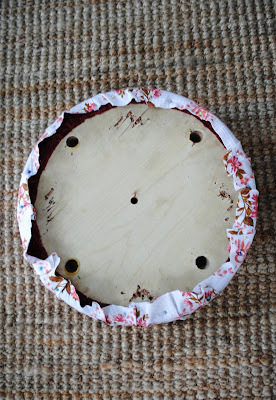 Lay the top part of the stool down and cut our a circle shape leaving enough fabric to cover the sides [as well as a little extra for stapling in place]. Believe it or not I used an ordinary stapler to secure the edging. Screw the top back on the stool base. 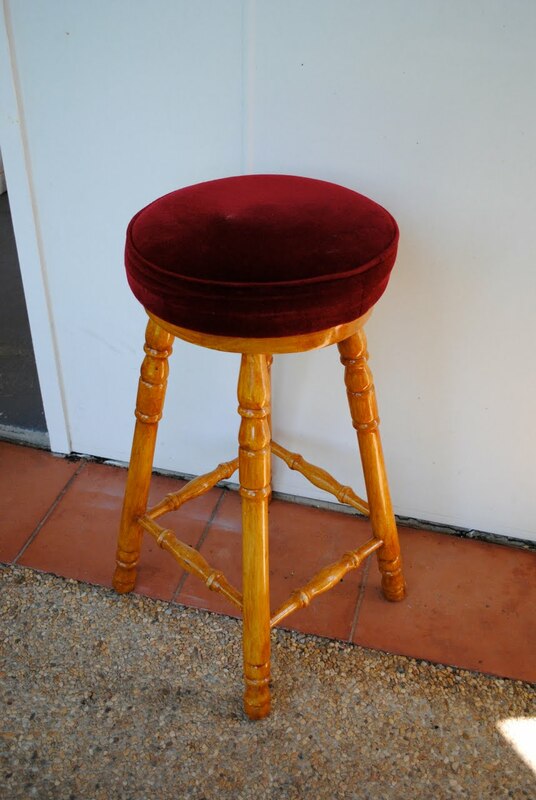 So whats better than one stool my friends ? Yes that's right, and of course I did not want them to match! Happy Sweet Easter my Friends. wow great job! i love them! Love your choice of fabric Simone! So cheerful. I loved the 1, but the pair together is so much fun. Is that wallpaper behind them? sweet and a perfect little Spring day project! They're so sweet. What a great improvement! wow they look great, I see these type of stools a bit on my hunts but never imagined they could look so good!! Si! An ordinary stapler??? I don´t belive!!! I loved.... oH! I always love! These are just gorgeous + you make it look so simple! Do you suggest that you spray + then paint always? 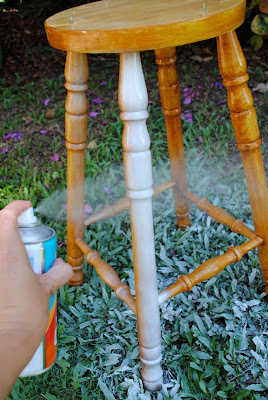 I've got a few redo's I want to do these holidays + I was just going to spray them. First timer here!! Hi Simone - Don't ya just love the power of spray paint. Your stools came out in your style perfectly. So bright and cheery. I hope you have a Happy Easter. I am happy to say that here in PA it is going to feel like summer 81 degrees. 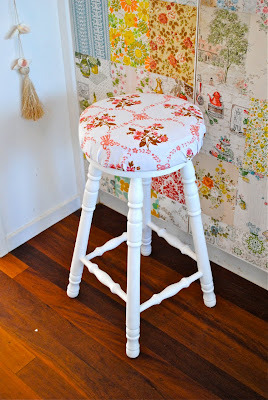 Oh that stool is so much prettier in shades of white and florals. The stool is beautiful, but you have painted the grass too! hmmm..gloss exterior spray paint you say? Maybe that's why it's never worked out for me. My spray paint always dipped and looked runny! Thanks for the tip. And I love your stools, esp. the blue fabric one! They look FABULOUS Simone! Well done, I love them! So cute stools. I would have never imagined they would look that great. They look great. I think a touch of white makes everything look better and the fabric looks so pretty. How cute! I especially like the aqua one. The color just pops! I like that you used two different fabrics, too. love this idea x 2! I would have imagined those stools nearly the same way! And of course, two is always better than one! Great job! so cute! i still love that wallpaper sampled wall. So sweet, SImone! I love the fabrics you chose as well. Love the colours in the fabric you chose for the second stool. I'll have to watch out for a stool I can do too! HOLA SIMONE, ME LLAMO LOLA Y HE DESCUBIERTO TU BLOG, LOS TABURETES TE QUEDARON ESTUPENDOS , ME GUSTAN MUCHO, SEGUIRÉ TUS PROYECTOS!!! I love the blue fabric on the second one! Great and easy makeover! ah, how fresh - don't you just love this type of thing! Lovely stools, and your wall behind. Great job on a sweet makeover. Amazing what a little paint and creativity can do. You have a wonderful Easter weekend. I don't like things matching in my home either! Simone darling, I have two stools that are in need of a make-over, and since you are such an expert at it, I will be right over!! Darling popped in to wish you and your family a joyous and blessed Easter. those are so cute. I'm painting all Easter weekend, can't wait to see my house brighter and lighter. me encanto!!!!!!! beautifull beautifullllllll!!!! !happy eastern!!!!!!! !and lots of kisses simonne!!!! 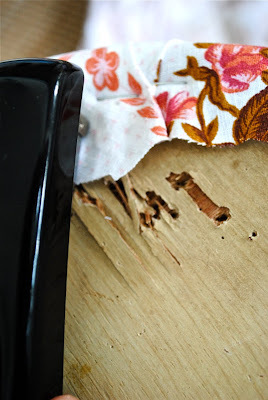 you have seriously the best DIYs ever. i am totally inlove with these stooollls. 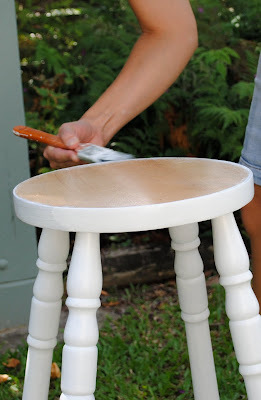 Hi, cute stools :) I was wondering if you sanded the chairs prior to spraying, or is the spray paint you used one that sticks to smooth surfaces? I really love this! They are so YOU. I found a stool in a skip last summer and recovered it. it's so satisfying to transform something so easily isn't it?! great idea using the spray paint as undercoat. Do you find it "holds" the top coats ok if you dont give a good sand first? 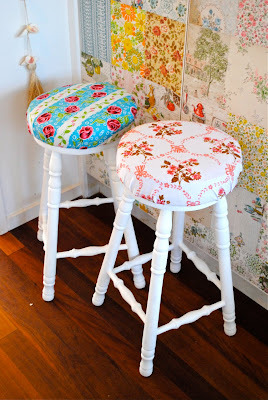 Love the looks of the stools, just lovely! Just love the stools. Have been on a lookout for my own that I can do up. Being patient and keeping a watchful eye on my local Oppies. Love your blog so much have nominated you for a sunshine award (which I'm sure you've received before - how could you not!). Have posted a link to your blog on my latest post. Feel free to visit if you'd like to pass it on. Thanks again for the inspiration. Love it specially the fabrics you chose. They're adorable! And aren't they in front of that wallpapered door you did awhile back? simone, those are just too lovable! fantastic work dear! That is soooo cute! I love the redo!!! Great job and that is the kind of stuff that I need to do!!! They look fabulous Simone!! Great! So cute. I can't believe you were able to use a regular stapler! Thank you for the inspiration! I just found your blog.. but I like it! It is nice to rediscover the old pieces of furniture in a new way.This also diverts your attention towards home to make it bright and beautiful. Is there any padding on the stools. I had four when my daughters lived at home. But, now I got two with backs on them that are larger so I am not using the smaller ones at the breakfast bar. I want to take at least two to my craft room upstairs and would love to pad them. I LOVE yours!